Born in 1898, Japan's Misao Okawa died peacefully in her nursing home earlier today. Here's how her remarkably long tenure on Earth stacks up against the longest human lives. 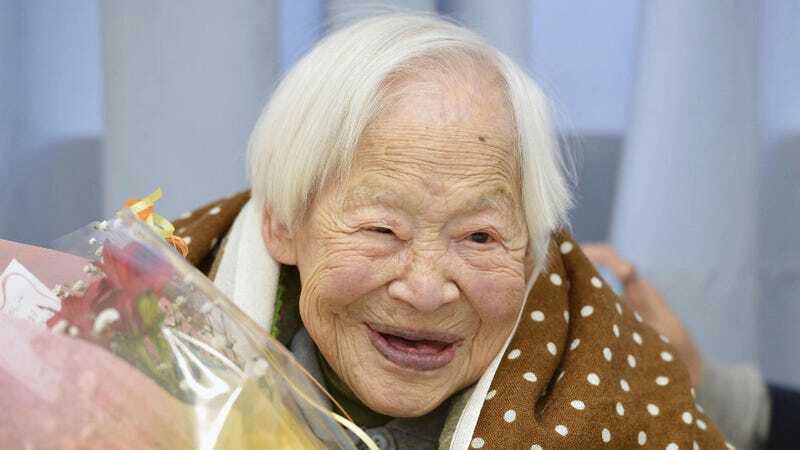 Okawa only recently celebrated her 117th birthday (that's a lot of candles) on March 5th, which she spent in the company of her, ahem, 92-year-old son and family. As reported in The Telegraph, she recently lost her appetite and finally let go of the mortal coil she had clung on to for so long. Last year, when marking her 116th birthday, she attributed her longevity to eating well, sleeping at least eight hours each night, and taking regular naps. She said it was also important to relax. To put her 117-year sojourn into perspective, the year of her birth — 1898 — was a time before the Wright Brothers had flown. The Spanish-American-Cuban war was going on, Marie Curie isolated radium and polonium, and William McKinley was president of the United States. Okawa is the 30th person to reach 115, the 10th person to reach 116, and only the 5th to hit the 117-year mark. For the record, the oldest human male to have ever lived was Japan's Jiroemon Kimura who lived to the ripe old age of 116 years and 54 days. With her passing, the oldest human alive right now is Gertrude Weaver of the United States, who is aged 116 years and 271 days.